News releases today highlight the dichotomy in how developed nations are facing Ebola: A commentary by Christopher Stokes of the charity Medicins Sans Frontiers said the disease was still out of control in Africa, and that it was “ridiculous” that volunteers working for charities have been at the forefront of the relief effort so far. This highlights how, in my view, the response in particular by US and UK governments (the two most frequently visited nations by international travellers from affected areas) has been politically and economically driven rather than aimed at being effective – it is common knowledge that temperature screening at airports is valueless in this fight and this has been the limit of their domestic action so far – yet the virus has an asymptomatic incubation period of up to three weeks. A scientific study of another terrible virus originating in west Africa – HIV, in the journal Science last week clearly makes the link between transport networks and early spread of the virus. 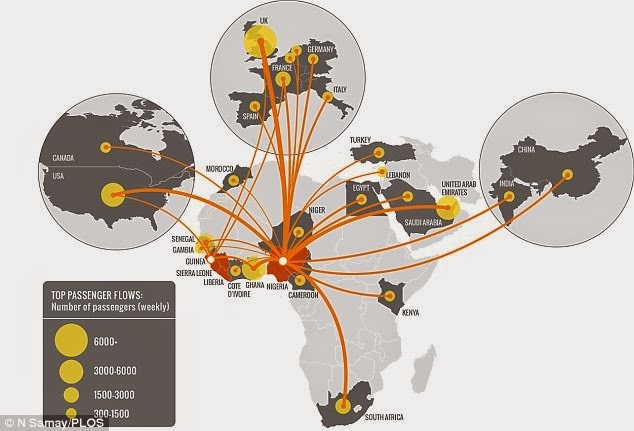 Similarly an analysis this week shows how Ebola will likely spread across international transport routes (below). It appears very strange to me that the argument (in the UK at least) that economic impacts would be “devastating” if air traffic was restricted, appear to have removed a discussion of restricting air travel/travellers from the table. However, there may be a sign that more sensible action is forthcoming from the Australians. A story on today’s SKY news network identifies that the Aussies are considering a quarantine system for all passengers arriving from affected states – I hope that this includes the US and Spain as well as west African nations. Let me be clear, THE ONLY WAY to truly halt the spread of Ebola in its march to become a global pandemic is to do this. So, well done Australia for having the bravery to suggest the right thing based upon expert medical advice rather than political compromise. Coupled with this there appears to be more rhetoric than positive action to help those in affected African countries thus far, and this outbreak has been with us for some time now. If the Australian quarantine option for international travellers was implemented worldwide along with a massive international medical and humanitarian effort in west Africa – the simple truth is that this would possibly all be over in a month. This means not just the US and UK, but other wealthy nations need to step up as well – so China and Russia if you want a seat at the ‘big boys table’ when it comes to security, lets see you also step up to the the plate when humanitarian needs arise as well (you may recall the response of China to the typhoon Haiyan disaster in the Philippines, where a derisory offer of USD100,000 coming begrudgingly and belatedly from China highlighted their lack of genuine concern for neighbouring nations).